The clothes, the hair, the moves…. Meanwhile, Jello (and his cat) share their enthusiasm for music (and vinyl). I sense a kindred spirit. Normal (blog) service will continue shortly. I have been distracted updating our home server (below) and upgrading computers from Windows XP. It’s all about m3u files. These little files list the tracks in a playlist. If carefully crafted, moving music between computers is as easy as ‘dragging ‘n dropping’ the m3u file from one computer (or a memory stick) and into iTunes in another computer. 1. Open iTunes and select the music section of your library on the left hand side of the screen. 3. Drag ‘n drop the m3u file into the right hand pane of iTunes. 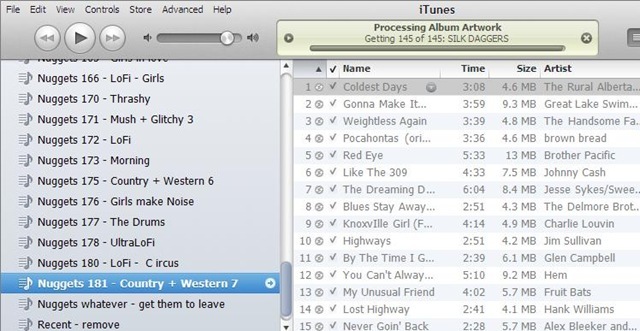 4. itunes will (hopefully) create a new playlist, and start copying the files across. 5. When iTunes finishes sucking the files across, c’est voila, the music is now safely loaded into iTunes on your computer. In iTunes go File >> New Playlist Folder. Then highlight the new folder to it give a name, and drag the playlists into the folder. To rename the folder, double-click on the name.